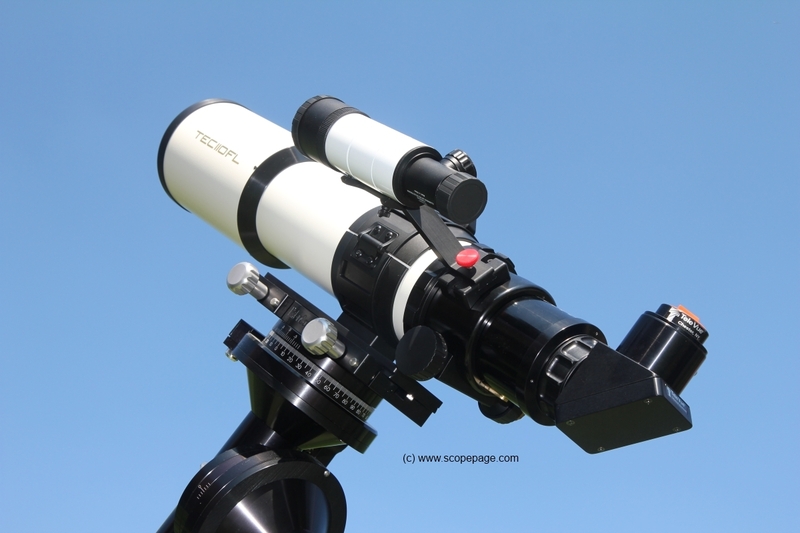 The new Eclipse apochromatic refractor by TEC (or TEC110FL) perpetuates the challenge of a small line of compact and portable telescopes of high quality in the 100mm range. In the last 20 years, these very prized high-end telescopes emerge from time to time… Their story is often short for various reasons; the main reasons being of course the difficulty of the realization (= price vs size) and also the difficulty of supplying the different glasses required for a very critical triplet. Anyway, the TEC110FL uses a CaF2 lens as a middle element of the oil triplet and may be considered as a successor of the famous Zeiss APQ 100/640... but with the size of the AP-Traveler… With an OTA “Length/Diameter ratio” of 4.4, it is probably, to my knowledge, the shorter optical tube of this category available today (*). This review does not have the purpose to give a full description of the scope. I suggest you download the detailed manual provided on the TEC Web site for more information. Please see also my review of the TEC140 which describes advantages/drawbacks of the oil triplet that both scopes have in common. 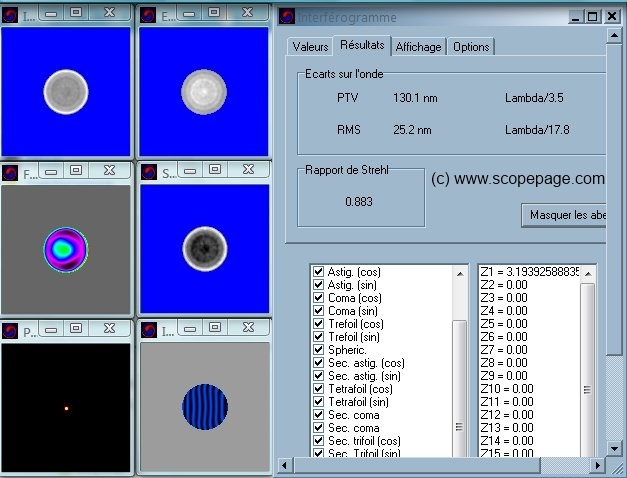 The scope reviewed here is one of the end of the first run delivered in France in July 2011. In 2013, about 80 TEC110FL have been produced; the next production run (if any) is not announced. 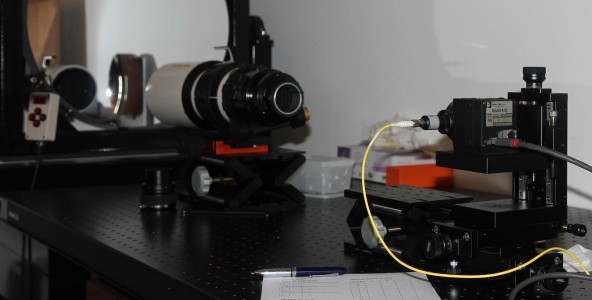 (*) Not taking into account other fast ratio optics, but not short optical tubes, built around Petzval systems with slow optics including a focal reducers (i.e TV NP101: OTA_Length/Diam = 6.5). The scope is a marvel by itself; it has a nice and original “touch” which distinguishes it from other productions. Its compactness (482mm retracted) is impressive. The aluminum front cover is simple; while it does not have the nice sliding latches of the TEC140, it fits the tube perfectly and, with a diameter of 140mm, is still easy to grip with one hand only. With heavy eyepieces and probably with imaging equipment (not tested), the OTA is perfectly balanced. This design proves being well conceived because the current/middle position of the clamshell ring is perfectly compatible with the dew shield retracted which is not evident with many short scopes… Consequently, there is no need of moving the position of the clamshell ring before/after/during the use: very good point! 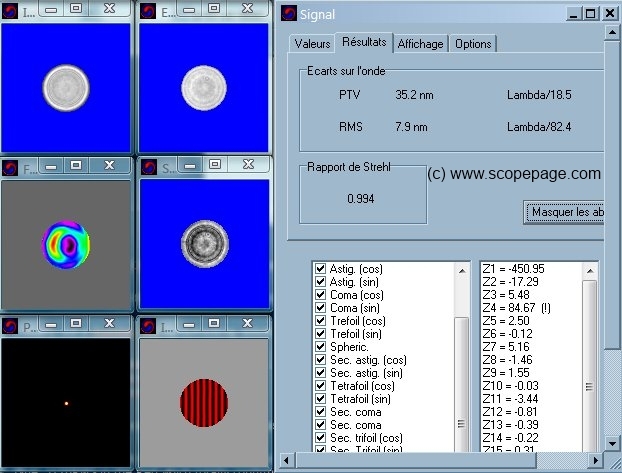 And if, eventually you need of rebalancing the scope, it can be done within a minute without any tool; just imagine adjustment of two rings in the dark…! This compactness does not compromise efficiency: the dew shield is long enough. 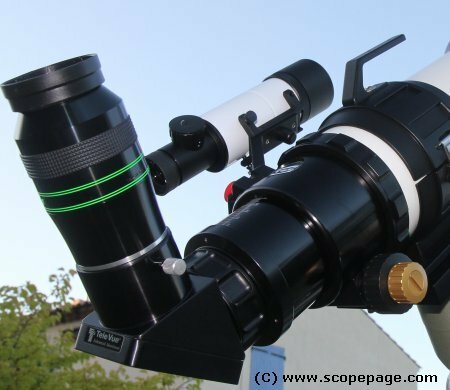 Once the dew shield is deployed and the eyepiece is in position and equipped, the scope takes a different look! A chameleon. Despite (but also because of the small size of the scope), it could be very difficult to grab it and to install it on a mount. Thanks to the handle attached to the beautiful clamshell ring, grabbing the scope becomes very easy but, in my opinion, not totally secure since the handle is too short and a “stop” is missing on its extremity. Using two hands (and even three if available given of the price of the scope!) is highly recommended since the handle may, accidentally, slip between your fingers (and the scope has been designed to follow the handle…). Overall, the design is absolutely outstanding. The focuser, entirely made by TEC, looks very solid and “technical”. It does not give the same feeling than the FT focuser but none is better than the other: I mean they are both of top quality. In practice, focusing is very precise with no sign of “elasticity” or “play”. Tension is fully adjustable from the fine focus knob up to the locking of the focuser (while it is not its function). There is no problem to adjust it for very heavy loads or to have it almost free... up to you to decide. You have to unscrew the cap and then adjust position/tension of the fine knob then re-screw the cap... It is easy to do, even in the dark but may inadvertently alter focus slightly. The focuser supports a load of up to 5kg what is respectable. 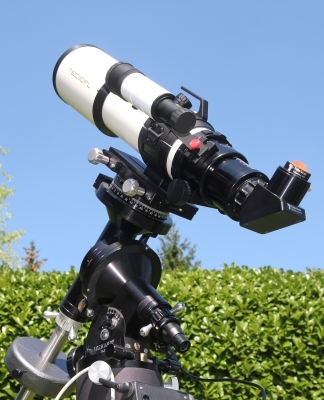 I have not noticed any sign of weakness with my heavier eyepieces ; however, for loads above 5kg or if load is asymmetrical, TEC recommends using a “setup ring” available as accessory. The rotation of the focuser does not generate any shift what is confirmed at high power. However, any action on the locking collar is at the risk to alter the current aiming (and the goto accuracy) especially with a small mount; I think the capstans of the TEC140 are missing here since they allow a smoother movement… TEC will reintroduce the capstans for the larger scopes. The 2” metal collar (EP side) is a real improvement over the plastic collar of the FT focuser. It is much more secure since it is stable under temperature variations (comparing to plastic one it does not changing holding force under different temperature) and does not require a constant attention while you modify the weight of the attached accessories; comparing to thumb screw ones - it is holding everything concentrically (by definition) and uniformly. TEC indicates that they will replace the Feather Touch focuser of all models by this new type of TEC focuser ; of course, the larger scopes will use a larger focuser (even larger comparing to FT3545). Please note, TEC now proposes the excellent 10X60 Vario Baader. What mount for the TEC110FL ? 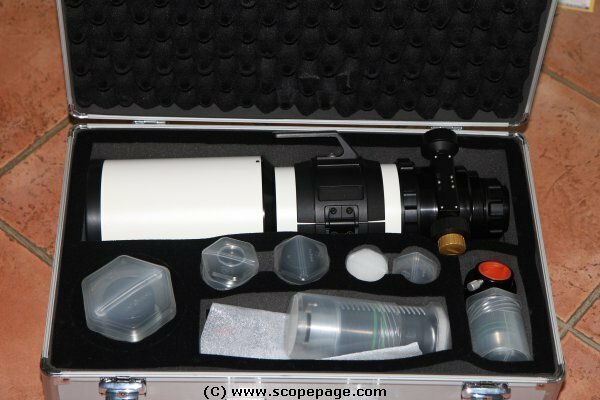 A quantity of equatorial or azimuthal mounts are available on the market for this 4.5kg scope (*). I am using my venerable GPDX as a portable mount on a Berlebach tripod (UNI28) and a G11 at home on a permanent pier. The GPDX (or GPDX2) matches very well the scope . I recommend using a Losmandy/Vixen adapter like this ADM adapter (weight ~1kg) rather than trying to assemble a Vixen dovetail below the clamshell ring ; quality of the alignment is at best with the 9” TEC dovetail. Please note the Losmandy plate (any length) allows for full retraction of the dew shield (since it is above the dew shield). (*) Good to know: Once the dew shield is retracted and scope is ready for use (with diagonal en Ethos 13mm), its length is about 750mm while it weights about 6.5kg. Weight of the ADM adapter (Vixen to Losmandy) is about 1kg. Focus point is attained easily without any ambiguity (really “snapping into focus”). Airy disc is perfectly defined with two faint rings (other stars show generally one only faint ring) and clean of any trace of blue “burr”, colored “plumes” (or anything else) ; diffusion is minimal as usual with a TEC oil triplet. A small defocus shows a perfectly symmetrical opening of the first ring for the same absolute rotation of the fine focus knob (my favorite test) what signs a very well figured scope; patterns are geometrically perfectly round (no trace of “pinch”, “astigmatism”, “discollimation”…). I then did a classic “star-test” but by using three color filters: red, yellow+green (two filters superimposed) and blue; in the green-yellow, asymmetry is practically insignificant: toward a very slight over-correction… In the red, in fact, I can’t detect any asymmetry (my filter may be more orange than red or my own sensitivity is the culprit since a slight under-correction should not be abnormal)!… and in the (visible) blue of my filter, a slight but more obvious over-correction is perceptible. Spherochromatism is a “necessary evil” in a triplet especially in a fast APO however this test confirms that it is well under control over the whole spectrum; correction around “orange-yellow-green” is excellent (*) as expected and tendency in the blue has no influence at focus. (*) better than 0.1PV (LSA+HSA) as per simulation using Aberrator. The realization of a fast triplet like the TEC110FL without air-space is a true challenge. For that reason, TEC claims a "relaxed" specification of 1/6PV in the green (instead of 1/8 for larger APO). Visually, I judge that the correction is excellent and very similar to the TEC140’s. (*) A result as low as 1/3PV in the blue should not be suprising for this design: specifications by Abbe for an APO objective are 1/2PV in the blue, 1/4PV in Red or Green. This TEC110FL meets these requirement easily. Something important for the representativeness of the test is that the result matches very well the visual star test: almost nothing found in Red or Green and visible but slight SA in Blue. 1/50RMS was confirmed with a perfect centering and through a selective filter (Baader Continuum Filter BW 10nm @ 540nm). The value in the Green for which the refractor is optimized is excellent for a refractor as short as 5.6 while the result in the blue meets the requirements for an APO objective. The TEC110FL APO is a perfect APO. Needless to say, on the moon, the contrast between the globe and the sky is absolutely perfect and does not show any color nor any irization… + contrasts are perfect: i.e, the sides of the Aristarque crater appear pure white with small asperities as visible on HD images and the projected shadows are totally black. Of course, curvature of field is high given the short focal length for the aperture (1/3FL); however, please be sure this is of NO concern for visual observations at least with a Pentax XW30 or a 35mm Panoptic… For imaging the Field Flattener (not tested) improves the field's flatness but also the correction in blue and is recommended (but it should not be employed for visual use). Cool down: is not a concern. The scope is immediately usable + WinRoddier does not show significant variation by low temperature or during cool down (unlike the TEC140 which shows a some variations). The results match very well my own Roddier tests especially in the green but not exactly in the red due to the poor sensibility of the DSLR in the red (as expected because of an under exposition; exposition is very critical with a Roddier test). The HASOtm confirms the high quality of the TEC110FL with a very nice strehl of 0.981 (RMS=1/45 PV=1/8.5) for the best focus in the green (*). 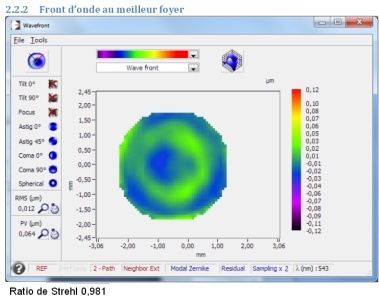 This very fast air triplet is also very well balanced between red and blue with a focus shift of 90µm (0.016%). The full detailed report is available for download under TEC110FL #2. The focus shift (RED-BLUE) - without FF - is the same than for one of the two FSQ106 tested and the NP101IS tested by Airylab (the second FSQ106 is better). Of course, as expected, the spherochromatism in the blue and the correction of the field are better for a Petzval than for the air triplet but this can be corrected with the Field Flattener as you can see by reading the report of the TEC110FL #1 (I don't have the FF). It should be noted the TEC110FL #1 has also an excellent correction but centered somewhere in the Yellow (above the Green) since the spherical aberration is reversing between red and green (**). This, however, increases the focus shift but can be corrected with the FF for imaging with only little consequence for visual use. While some expect the same results in the blue for the TEC110 than for an F/7 scope (this is simply not possible), these results are consistent and remarkable for a very fast OIL TRIPLET like the F/5.6 TEC110FL. If needed, the FF transforms your scope into a "Petzval equivalent". The drawback is that the TEC110 is very difficult to produce and it is not sure that TEC continues its distribution. (*) Modal mode: Like Roddier and many other software (Zygo, AtmosFringe...), HASOtm reconstructs the wave front as the sum of a series of known modes (Zernike's equation). This algorithm allows a quantification of the various aberrations including a variable "defocus". This method optimizes the wavefront exactly like the user does it by focusing. In Zonal mode (denomination which seems specific to this software) HASOtm optimizes the wavefront for the smallest ray spot. 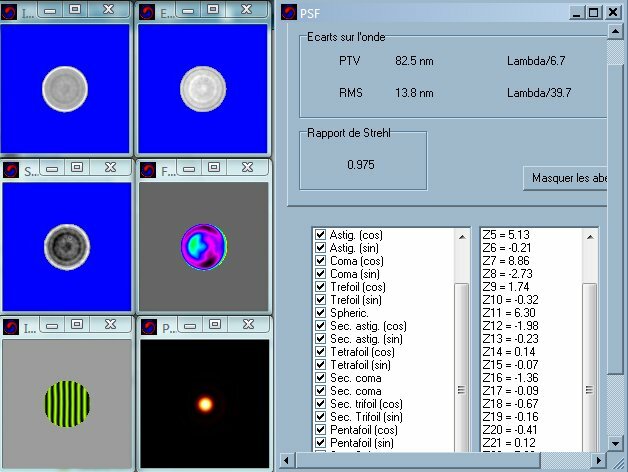 This allows a raw quantification of the spherical aberration and of the optical design (and comparing them) ; it is an interesting data for imaging (with or whitout FF) but is not really representative in visual use. In fact both are interesting but generally, only the Strehl for the best best focus is calculated and advertised. For more information, see telescope-optic.net. (**) The "null" can NOT be observed with a laser operating at 3 fixed wavelengths. It is common to end such a test by splitting some challenging double stars. Theoretical resolution is about 1.1”; for 1.1” Airy disks must appear just separated by a darkening; for 1.2”, splitting is fully achieved. I choose first STF 2289 (Hercules); its period is long (3000y) and the distance of the components does not change a lot over time. It is slightly asymmetrical (Mag 6.5/7.2) which make splitting a bit more difficult and has a separation of 1.2” just above the theoretical resolution of the TEC110FL (1.1”). It was easily and totally split at 150X with a ZAO 4mm. STT 299 (Bootes) is the right target with a separation of exactly 1.1” (2011) and was split despite a slight difference in the magnitudes (6.89/7.55). STF 2034 is also 1.1” with magnitudes of 7.68/7.95. It was easily split. Delta Cygnus is an interesting test target: it has a large difference of magnitude (2.86/6.5) and the smallest companion (at 2”) overlaps with the first diffraction ring of the 110mm objective. It is very well split, absolutely obvious at first glance. Finally STF 228 in Andromeda which separation is about 0.85” (in 2011): something is suspected… slight elongation (under good seeing). an XW30 for the large fields (3.5° exit pupil 5.35mm). I too have the Panoptic 35mm which gives almost 4° of field but (IMO) a too large exit pupil (6.25mm). I would have an Ethos 21mm but it is still not in the box.. Note: These are just the EPs I own, not recommendations. It is up to you to use any other brand. A case is offered with the first run. It is of standard quality, not premium (attention to the strength of joints over time) but it is decent, very convenient and help packaging all the necessary equipment for visual observations making the TEC110FL a really “grab and go” observatory: it contains one big EP, one Ethos 13, 5 standard EPs, a diagonal and the finder + the scope! I had the chance to give my TEC110FL its first light under the pure sky of Provence in the south of France. These are my comments. There is a lot of targets accessible and fun to observe with this scope especially taking advantage of its very large field. Veil nebula and its various parts are marvelous with an XW30 equipped with an UHC filter as well as the America nebula whose borders appear clearly delimited (but reversed by the diagonal) almost like on the photographies. With the large open clusters, these large diffuse nebulae are targets of choice for a short APO like a TEC110FL since it may be difficult to observe the objects in full with a larger telescope. M57 the ring nebulae is surprisingly well resolved as only a miniature of what can be seen in larger scopes… You almost are not losing anything (in comparison with a 140 or 200mm), it is just smaller! The Wild Duck Cluster is one of my preferred object : it is always a marvel (here with a Radian 8mm). I think the view of this cluster (and this is the case with some other Open Clusters) does not improve significantly with an increase of the diameter. Epsilon 1&2 are perfectly and easily resolved what is not a surprise while view of the double “double” may be more impressive with larger diameters. NGC 6826, the “blinking nebula” is always fun and an easy target for the TEC110FL; the central start is visible in direct vision surrounded by a pale halo which immediately “lights up” in averted vision. GC40(AND) is a nice a planetary nebula: it is visible without difficulty with its central start with the TEC110FL but there is no chance to reveal its red color what is perceptible with a 200mm. The shape of M51 and its companion are easily recognizable; I think I can see the “bridge” but it is not obvious (not sure)… Anyway, none of the heterogeneity of the main spiral which suggests spiral arms is visible unlike in the TEC140. In comparison with my larger instruments (TEC140/MC200...), generally (I mean by "average" (but not bad) seing), I do not lose a lot, although the view in the larger instruments is a bit more easier. Of course, if the seeing is perfect, there is no magic here, my 200mm will show me you more! On Jupiter, main features are easily seen as well as some irregularities in/between the bands and darkening near the poles ; the festoons are only suggested by these irregularities. On Mars (13" this year), I was surprised to recognize the main areas (pole of course but also Sinus sabaeus, Mare Erythraneum...): may be not so easily but without any doubt. 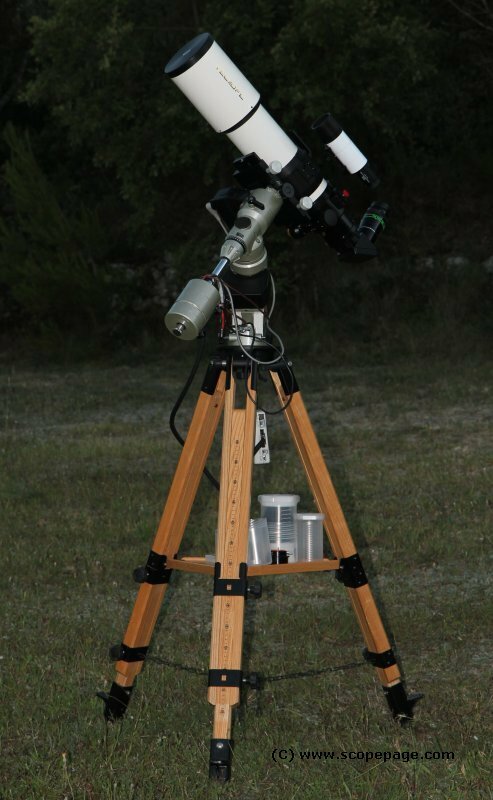 Anyway, you don't have to be complexed to use a 110mm (but perfect) aperture for viewing the planets! Most of the year, this is enough (unfortunately) ! 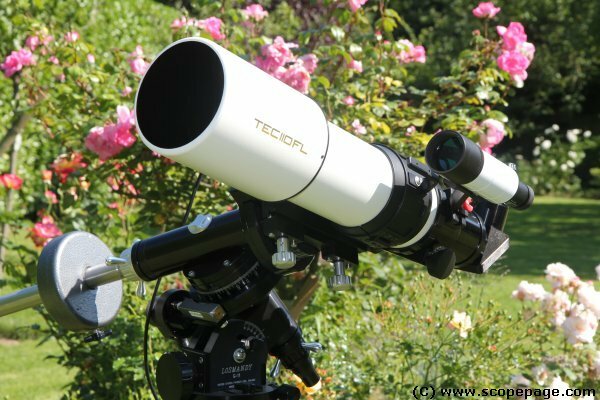 I was already owner of two TEC telescopes (TEC140 and MC200) and I am extremely satisfied: I have seen with my own eyes the real quality of the optics and reliability of the mechanic, in real use, over several years. In addition, a high-end telescope, whether it is Russian, American or French, can not be a mass produced instrument given the many manual interventions required; it seems, therefore, essential to know its origin. TEC (with AP and some suppliers of mirrors) is one of the rare opticians in the world who allow a direct exchange with their customers; this contribute to the intrinsic value of the object and the pleasure to use it. In conclusion, the new TEC110FL is an outstanding compact refractor telescope. Figuring of this short APO objective was certainly a challenge and I admire the work at its fair value. The result is certainly in same line as the legendary Zeiss APQ100/640... I am nearly sure Yuri and his team have been inspired by this, now, historical scope.. Who knows?